The Enterprise Network Mapping and Leak Detection System (ENMLDS) was mandated by the U.S. government to locate unauthorized networks, machines, and connection points, and prevent leaks of classified data to unknown network intruders. PROMIA’s ENMLDS solution consists of a secure network appliance that is active across a multi-layered network architecture. It can be managed using an internet browser and can discover, map, and detect the presence or absence of unauthorized network connections. The Promia ENMLDS solution can perform these tasks across an entire network, as well as, specific network segments or local enclaves. ENMLDS enables leak detection by taking a snapshot of a classified or other network at several levels of the OSI model, specifically Level 2 (Data Link Layer) and Layer 3 (Network Layer), on a regular basis. Any differences from the known topology of the classified network may be considered unauthorized and a possible threat. Any new connections or hosts on the classified network can be interrogated to see if they have authorization to be on the network. If not, action can be taken to remove the machine(s) or unauthorized network from accessing the classified network. A rogue host or network is any host or network that appears on a network segment that it should not be on. For example, if somebody sets up a new LAN on an existing network, that LAN network is rogue as it is not in the list of authorized networks. ENMLDS is able to stop ex-filtration via a proxy-list and a watch-list. Ex-filtration is the leaking of data across network boundaries. This can be as simple as making something available that should not be, or as complex as a hacker siphoning of data. 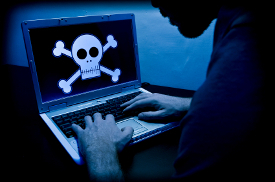 A proxy-list is a list of known proxies that ENMLDS can alert to and block. A watch-list is a list of hosts that ENMLDS can alert and block. Enterprise Network Maps are visual representations of various aspects of one or more networks, depending on the size and number of networks within the enterprise.